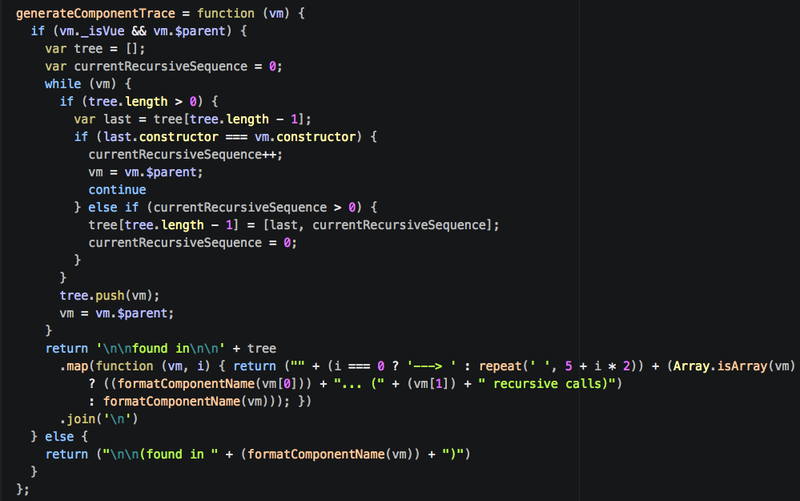 If you are just joining, this is the 12th post in a series going over the entire Vue.js source code line by line. In this post, we look at the generateComponentTrace function. In the last post, we glossed over the implementation details of generateComponentTrace to focus on the logic of the warn function. In this post, we loop back around to the generateComponentTrace function. You will recall that the ._isVue property is set to true within the Vue.prototype._init method. generateComponentTrace next checks whether vm.$parent coerces to true. Establishes a parent-child relationship between the two. The parent will be accessible as this.$parent for the child, and the child will be pushed into the parent’s $children array. We will take an even deeper look at the parent-child relationship and how the parent becomes accessible as $parent when we discuss the initLifecycle function. For our purposes in this post, we can move forward just knowing that the if statement is checking whether the Vue instance has a $parent property. In other words, the loop works recursively up through the Vue instances through their .$parent properties and exits when an instance does not have a .$parent property. And that is the end of the while loop. It runs until you reach a vm with no .$parent property. Next, we hit a lengthy return statement. We’ll start taking a look at that return statement in the next post.